19 1/4 inches. 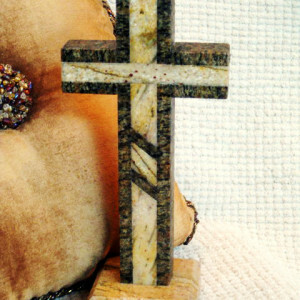 This standing cross is stunning! It is made from white onyx which is semi transparent. You can see the opaque and semi transparent areas crisscrossing each other in various patterns throughout the cross. Any back lighting makes the patterns really comes to life. The onyx base is beautifully accented with multi hued green granite. We have added small angled rectangular pieces to the top of the cross as well. A crown of thorns reminds us of Christ's love for us. This cross needs no back lighting to be beautiful. Our pictures are not back lit. Small imperfections are part of the beauty of handcrafted, natural products and are often intentional in my work. 11 inches. 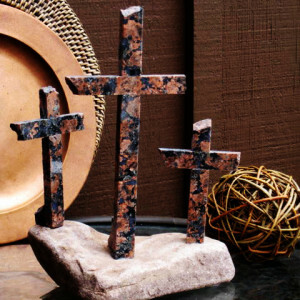 This standing cross for tabletop use is made from warm golden tan Juparana granite which is surrounded by a darker medium toned multi-hued warm brown. The colors blend so beautifully that Rick wanted to put more of them together so he added an inlay in the cross for an added flair. Very sharp looking. Small imperfections are part of the beauty of handcrafted, natural products and are often intentional in the work. 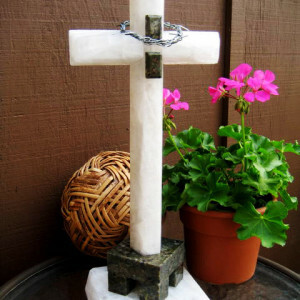 The standing tabletop cross is made using a multi hued brown granite and it is outlined with light brown travertine. The top edges have been broken as well as some edges of the base, which adds texture and character. Slight variations from cross to cross.